Publishing a page makes all the changes appear live and visible to visitors. The Publish button is the button with the Play symbol located at the top left of the interface. When changes are made to a page, the Publish button turns to orange. As long as the button is not clicked and remains orange, the changes remain in the draft state and do not appear live. Internet users see the page as it is since the last publication. It is therefore possible to modify one or more pages and not to publish them until the content is ready to go online. When several changes have been made to several pages, it is possible to publish them all at once. 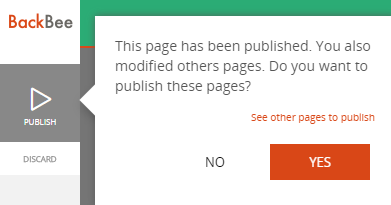 Click on "NO" if the content of the current page only needs to be published.